After writing about the future of NASA, it’s time to visit the Apollo Saturn V building, located at the Kennedy Space Center. When President John F. Kennedy stated on May 25, 1961, “I believe that this nation should commit itself to achieving the goal, before this decade is out, of landing a man on the moon and returning him safely to the Earth” NASA was faced with the task of developing a rocket that could achieve this mission. The Saturn V rocket was developed and used successfully from 1968 to 1972. The only way to see this rocket, is to take the complimentary bus tour to the building where an original, unused rocket is on display. It is an impressive sight, and the building has been remodeled with some new displays. 2017 marks the 50th anniversary of the tragic accident to Apollo 1, and they have added a nice memorial to the three astronauts that lost their lives in the fire. After watching a brief video, and then a simulated countdown of an Apollo launch, with all the original launch command room equipment, you walk right smack into the five F-1 engines located on the first stage of the rocket. Using a mixture of liquid oxygen and kerosene fuel, it could reach a speed of 6,000 miles per hour in three minutes. A side view of stage one. They have a small-scale model of the entire rocket, and spacecraft. At 363 feet, it is difficult to photograph the original! The second stage of the rocket on display. The third stage will take the spacecraft out of Earth’s orbit. The Apollo spacecraft on top of the rocket consists of three components: the Lunar Module, Service Module and Command Module. The Launch Escape System (below right) is attached to the command module. The photograph below displays an unused command module (with heat-reflective silver coating) attached to a service module below the rocket. The building contains the command module from Apollo 14, which shows how scarred the spacecraft gets from re-entry into Earth’s atmosphere. Apollo 15 was set to carry this Lunar Module to the Moon. However, NASA decided to also send up a Lunar Rover, so the module was redesigned, and this one was never flown in space. It is a crazy looking thing, that seems to be wrapped in gold-colored aluminum foil. The bottom half (with the “foil”) remains on the surface of the moon, and the astronauts return to the command module in the top half. A Lunar Rover, built from spare parts, is on display in the building. Along with a spacesuit from Gene Cernan. There are many additional displays and a few movies to view in the Apollo Saturn V Building. With the bus tour, and stop at the building, you can easily spend 2 – 3 hours viewing the exhibits. It is definitely a “must see” on your visit to the Kennedy Space Center Visitors Complex. Next up: the Space Shuttle. Quote for the day: “We hope that if anything happens to us it will not delay the program.” – Virgil “Gus” Grissom, Commander Apollo One. Celebrating 150 years of birthdays!! Hello everyone! It’s me, Makena! For those new to the blog, I’m a Jack Russell Terrier who occasionally takes over my parents blog. It’s always good to get the dog’s perspective! My mom was going to post another blog about their visit to Kennedy Space Center, but today is a very special day….my 10th birthday! And even better, I get to celebrate it with Grandpa Stu (Dan’s dad), who turns a fit and fabulous 80 today! Tomorrow is Aunt Linda’s Birthday (Dan’s sister). Linda is the BIG 60!! So altogether, we are celebrating 150 years of birthdays! Whew, that’s a lot of candles. Hopefully the smoke detector won’t go off! Now in human years, I am 56 years old (based on age and size of dog). Sorry Aunt Linda, you still are older than me! Grandma and Grandpa came over to the RV park for a visit today! They took me over to the dog park to play football with me! And I had presents and birthday cake too! A new football from my grandparents! More presents and a card! Grandma baked a delicious cake for grandpa and me! I know it was good, because I snuck in a quick lick! I tried for more, but grandma and grandpa blocked my route! Sadly, this will be our last day in warm and sunny Florida. Tomorrow my parents will be hitching up the fifth wheel and heading back to Wisconsin to help out their friends, Mike and Karlyn, finish up remodeling a new business. So I will be spending the next three days riding in my crate in the back seat of the truck. I don’t mind, because every 2 or 3 hours they stop and I get to walk around and pee about 15 times at a gas station or rest area. Sometimes my mom thinks I have two bladders! Since it’s been a while since I have blogged, I will catch you up on a few other events. For Christmas, my parents bought me an orthopedic dog bed, to replace my old one that didn’t have much padding left. They also bought themselves new throw blankets. While the bed is nice and comfy, I decided they don’t need two blankets. They can share one, and I have claimed the other as my own! Last night my parents went out to dinner in New Smyrna Beach with three couples from the campground that will not be coming back here next year. They will be traveling out West next winter. We wish them safe travels, and hope to see them sometime down the road! It has been another good year in Florida. Hopefully warm weather will be waiting for us in Wisconsin? As always, thanks for following along on our journey! We have made several visits to the Kennedy Space Center Visitor Complex on Merritt Island, just south of Titusville, Florida. There are plenty of things to see and do, and a few exhibits are under construction, so we will have more to explore next year when we return to Florida. The visitors complex is separate from the Kennedy Space Center (KSC). The visitors center is operated by an outside firm, and does not receive any government funding. I will break up my blog into several posts, starting with the future of space exploration. NASA continues to operate at the space center. Some people are surprised by this, and think the space program was cancelled due to budget cuts from Congress several years ago. They are no longer flying the Space Shuttle, as it had completed its two main missions: build the International Space Station, and launch and repair the Hubble Telescope. NASA has partnered with private companies such as SpaceX and Boeing to continue servicing the Space Station and sending satellites into orbit. Both of the private companies are planning on sending manned trips to the Space Station. Currently the United States has to pay Russia to send our astronauts up there. NASA is focused on the next generation of space travel and exploration. They are working on the most powerful rocket ever built, Space Launch System (SLS) and a new space craft, Orion, which will go to Mars. The first launch, called Exploration Mission – 1, is tentatively scheduled for 2018. There is a bus trip that takes you around KSC, as part of the admission to the Visitors Center. The most famous building, visible for miles, is the 526 feet tall Vehicle Assembly Building (VAB). This building was constructed in the 1960s and was used for both the Apollo and Shuttle programs. It is now being modified for use to assemble Orion and SLS. This view below shows the side where the rocket exits the building and moves down the gravel road to the launch pad. The building on the left is the launch control center. Once the space craft and rocket booster has been assembled in the VAB, it will be moved down to the launch pad on a giant mover vehicle. Construction is underway on the launch tower for the SLS. This tower will eventually be moved to the launch pad. NASA will be using launch pad 39B, which was used for both the Apollo and Shuttle programs. They are currently demolishing the old launch facility, and building a new tower to be placed on the launch pad. This is the current view of pad 39B. The towers that you see are lightning rods. SpaceX has obtained a 20 year lease to use launch pad 39A. They recently launched Dragon-9 which carried supplies on a trip to the Space Station. It was the first time this pad has been used in years. The white tower on the right in the picture below is what they use for their rocket launch pad. The tower on the left is what remains from the shuttle program. The bus tour is very informative, both for the history and the future of the space program. For an additional charge, there are several more in-depth tours that you can take. We plan on doing this next year when we return, to see what has developed with Orion. NASA has a model of the 364 feet spacecraft and rocket on the tower. The spacecraft would be at the top of the model, just above the NASA logo. Below is what the Orion spacecraft will look like. The base is 16 feet in diameter. It can carry 4 – 6 astronauts. NASA currently has 3 rovers on Mars. They have models of all three on display in their newest exhibit, Journey to Mars. The smallest, Sojourner, landed in July of 1997, and broadcast images until September 1997. In January of 2004, two rovers landed on opposite sides of Mars. The Spirit mission ended March 2010, but Opportunity continues to roam around. The larger Curiosity Rover is about the size of an ATV, and it landed in August of 2012. It will break down and “digest” rock samples and send back data on what it “ate”. It will be exciting to follow along on NASA’s progress in the Journey to Mars. Right now they estimate sending humans to Mars in the 2030’s. Stay tuned for additional posts on the center. Quote of the Day: “Mars has been flown by, orbited, smacked into, radar examined, and rocketed onto, as well as bounced upon, rolled over, shoveled, drilled into, baked and even blasted. Still to come: Mars being stepped on.” – Buzz Aldrin, from his 2013 book, Mission to Mars: My Vision for Space Exploration. Obviously I did not make a New Years Resolution to blog more frequently, since this is only my second post this year! We really have not done too much here in Florida. Dan drove his parents down from Wisconsin at the end of January. They are renting a condo, in New Smyrna Beach, about 20 miles from us. There is a dog-friendly beach in the area, and we made the mistake of going there on the first warm Sunday. Parking is limited, so you have to wait until a spot opens up. So we sat in line for almost one hour, but it was worth it, as Makena had a great time running around on the beach with her grandparents! Karen, Dan and I decided to check out one of the space capsules they had on display. It was pretty cozy inside! We managed to get in one round of golf at The Great Outdoors RV resort, with Ken and Martha, who do an excellent monthly podcast called RV Navigators. It is free on I-Tunes, and very fun and informative to listen to. Dan noticed an alligator peeking out of the water when I was hitting the ball. He made me move my ball a few feet because he thought I was to close to Mr. Gator. Of course there is no penalty stroke from moving your ball when it is a few feet away from a gator. At the end of the month, we had our “Disney fix” for the year when we headed to Disney Springs which is a shopping and dining area on the Disney complex. It is one of the free areas to attend. We met up with Karen and Al, and Tom and Ellen for a nice lunch. It was great catching up with everyone. Dan’s brother and sister-in-law will be arriving tomorrow for 2 weeks. They will be staying in New Smyrna Beach by Dan’s parents, so we will be busy with them. After that, we may be heading back to Wisconsin. Our friend Mike, who is remodeling an old building for a new tavern and eatery, separated his shoulder. So he asked if we could come back to Wisconsin to help him finish the remodeling work we started with him a few months ago. We are still working out the details, but it looks like we will cut our Florida time short this year to help out again. 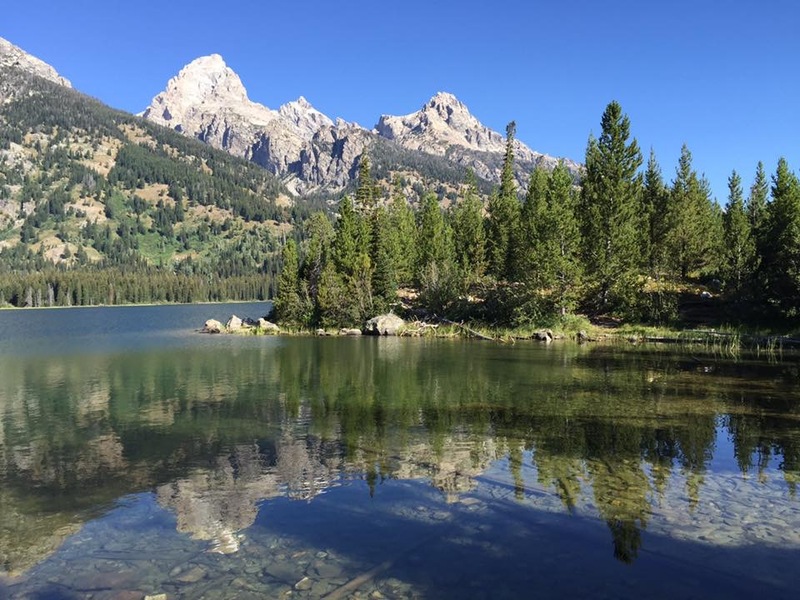 In May, we need to head to Wyoming for our summer job, back at Luton’s Teton Cabins.